Journey with us back in time to our exodus from Egypt. Join Central Synagogue to celebrate the first night of Passover with a warm, traditional and communal atmosphere featuring songs and insights suitable for grandparents, parents and children alike. 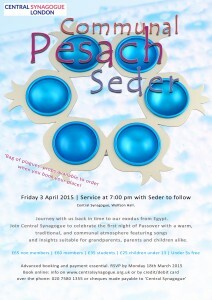 To book please contact the office on 020 7580 1355, email bookings@centralsynagogue.org.uk or book online.